The sixth iteration of the bilateral ‘Warrior’ exercise concluded in Punjab. Last week, China and Pakistan concluded the 2018 iteration of their Warrior military exercises. The counterterrorism focused exercise took place in Pakistan, in Pabbi in the province of Punjab. The exercise involved special operations forces from the Pakistani Army and the Chinese People’s Liberation Army (PLA) and began on December 8, 2018. “The exercise was conducted according to a process including multi-dimensional reconnaissance and search, three-dimensional maneuvering deployment and control, comprehensive fire assault exercise, searching and clearing building, air-ground coordinated attack, and joint defense and control,” PLA Daily, the official newspaper of the Chinese military, reported. 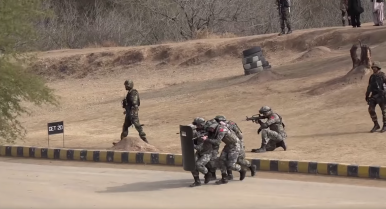 This year’s exercise is the sixth iteration of the bilateral Sino-Pakistani drill. The exercise’s conclusion was attended by the Pakistani Army’s Inspector General Training and Evaluation (IGT&E) Lieutenant General Sher Afgun, a statement released by Pakistan’s Inter-Services Public Relations noted. Sino-Pakistan cooperation on counterterrorism operations has intensified in recent years, particularly after Beijing’s announcement in 2015 of the China-Pakistan Economic Corridor, a multi-billion dollar set of infrastructure, connectivity, and other projects in Pakistan. Earlier this year, Gen. Qamar Javed Bajwa, the chief of the Pakistani Army, met China’s top paramilitary force commander to discuss bilateral proposals to increase cooperation between the two sides. The two sides cooperation multilaterally in the context of the Shanghai Cooperation Organization and, last month, concluded a trilateral memorandum of understanding with Afghanistan to increase trilateral coordination on counterterrorism. The latest iteration of the Warrior exercise began just two weeks after the Chinese consulate in Karachi was attacked by terrorists, killing seven Pakistani citizens. No Chinese diplomats or consulate personnel were killed or injured in the attack, but the incident underscored the increased targeting of Chinese nationals in Pakistan. Can China Mediate Between Pakistan and India?China-Pakistan Economic Corridor: The Uyghur Challenge and the Chinese Security Model2017 BRICS Summit: Post-Doklam, India, China Meet in XiamenChinese Navy Task Group Visits Pakistan With a Focus on Increasing InteroperabilityCan China Help Mediate Between Afghanistan and Pakistan?